This is the first time total oil product stocks have breached 22 million barrels since August 14, 2017, when they stood at 22.514 million barrels. Stocks of light distillates fell 5.6% standing at 11.3 million barrels, falling from their record high seen last week to set a second highest high since stock reporting began. News of upcoming turnarounds at a number of refineries across Asia was putting a floor on some of the bearish sentiment seen in the market in recent weeks, trading sources noted. "The market is likely to be less bearish than it was before," one Singapore-based market source said Monday. "Upcoming turnarounds from major producers would be supportive of the market," the source added. 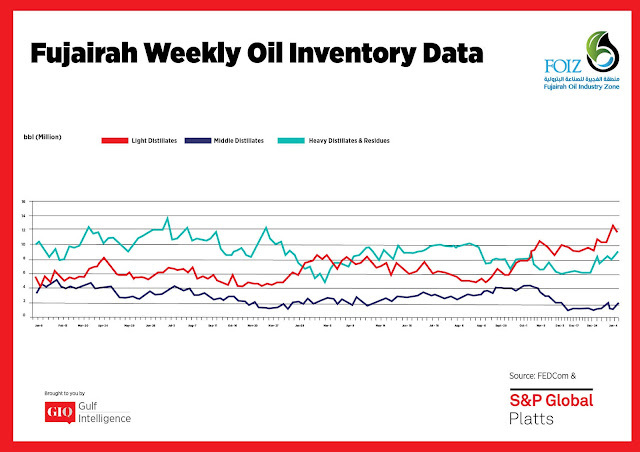 Stocks of Middle Distillates almost doubled posting a 79.1% increase to hit 2.273 million barrels, rebounding from last week’s 1.269 million barrels which were the second lowest posted amount since stock reporting began. The start of February saw a pick-up in activity in Singapore in the days prior to the lunar new year break, with January having been characterized by a lack of momentum in the market. Overall front-month gasoil cracks in Singapore through January stood at $14.27/b, a $1.35/b fall from 2018’s average of $15.62/b. Stocks of heavy residues showed a weekly rise of 7.1% to 8.733 million barrels, a more than 5-month high. 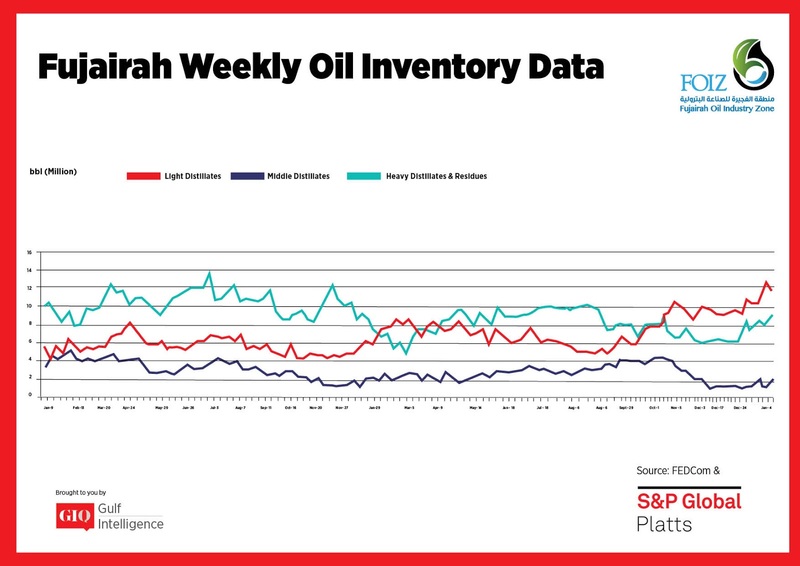 They were the last higher on August 20, 2018, when they stood at 8.939 million barrels. 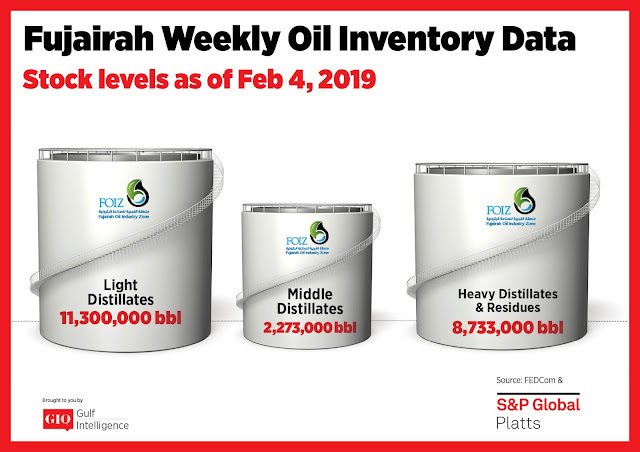 Overall availability of bunker fuel in the port of Fujairah remained healthy at the start of February, in line with the market seen in January, sources noted. "We definitely saw more [cargo] supply in January compared to December, and bunker avails are also okay for prompt dates," a Fujairah bunker trader said. In Fujairah ex-wharf 380 CST bunker fuel premiums over the Mean of Platts Arab Gulf 180 CST assessments averaged $6/mt in January, coming off from an average of $13/mt seen in December, Platts data showed.